Opened in 1824, the Montparnasse Cemetery (le Cimetière du Montparnasse) is the city’s second-largest cemetery after Père Lachaise. It is a cultural highlight of the Montparnasse neighborhood, thanks to its history and famous residents; after all, it’s the final resting place of Jean-Paul Sartre, Serge Gainsbourg, Charles Baudelaire, and more. Originally known as the Cimetière du Sud (the Southern Cemetery), Montparnasse is one of Paris’ three largest and most important cemeteries. Established on what was formerly farmland, the cemetery is today renowned as a final resting place of artists, writers, and other important cultural figures. High-profile graves (including those of Charles Baudelaire, Simone de Beauvoir, Julio Cortázar, Samuel Beckett, Guy de Maupassant, Susan Sontag, and Man Ray) have made it one of the neighborhood’s most popular tourist attractions. Although the Montparnasse Cemetery is free to enter, guided walking tours of the landmark help draw attention to its highlights and make its scale manageable. 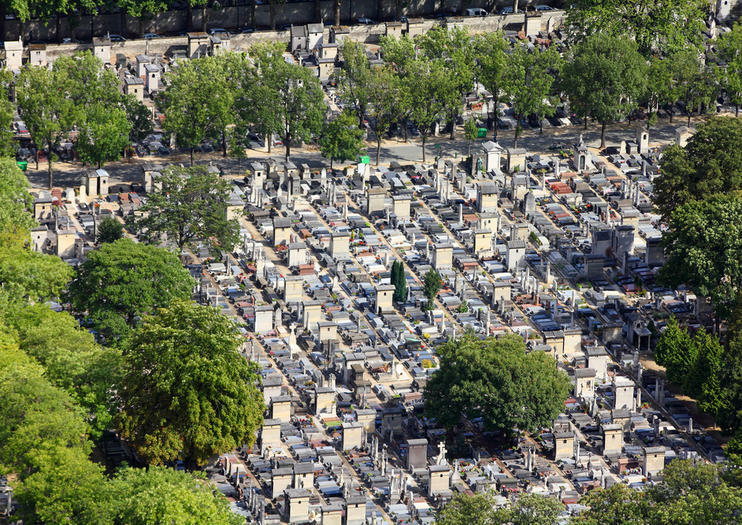 The Montparnasse Cemetery stretches across 47 acres (19 hectares) and contains more than 35,000 graves. The cemetery, currently divided into 30 sections, is still expanding: roughly 1,000 new residents are added each year. One highlight is the Tower of the Mill of Charity, a listed Historic Monument and the sole remaining piece of an 18th-century mill that once stood on-site. Take Métro lines 4 or 6 to the Raspail station, which is located at the corner of the cemetery. The major Gare Montparnasse is also nearby and is served by the TGV and other train lines, while the Montparnasse – Bienvenüe Métro station connects to the 4, 6, 12, and 13 lines. Alternatively, take bus lines 28, 58, 82, 88, 89, 91, 92, 94, 95, or 96 to reach the site. The cemetery is also accessible on foot, by taxi or car, or by Vélib’. Montparnasse Cemetery is open daily; depending on the season, it opens at 8, 8:30, or 9am and closes at 5:30 or 6pm. The cemetery is a scenic destination throughout the year, whether flanked by golden leaves, dappled with sunlight, or dusted with snow. Use your visit to the Montparnasse Cemetery as an excuse to see other neighborhood highlights. Visit the observation deck at the top of the Tour Montparnasse, explore the adjacent Fondation Cartier pour l’Art Contemporain, or see the subterranean Catacombs of Paris. Ta en 2-timers spasertur i Paris med en privat guide for å få innblikk i historien og kulturen i Montparnasse-distriktet, et trendy nabolag med en rik fortid og god arkitektur for å beundre.